Should be basted with a very little butter and a little flour, and then sprinkled with a little dried sage crumbled.—Apple-sauce and potatoes for roasted pork. A spare-rib should be basted with a little butter, a little dust of flour, and some sage and onion shred small. Apple sauce is the only one which suits this dish. 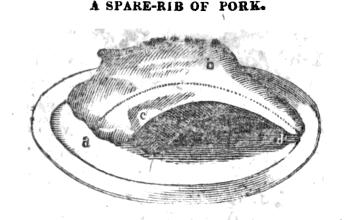 A spare-rib of pork is carved, by cutting out a slice from the fleshy part, in the line a,b. This joint will afford many good cuts in this direction, with as much fat as people like to eat of such strong meat. When the fleshy part is cut away, a bone may be easily separated from the next to it, in the line d, b, c, disjointing it at c.
The sides of a hog are made into bacon, and the inside is cut out with very little meat to the bone. On each side there is a large sparerib; which is usually divided into two, one sweet-bone, and a blade-bone.